All Types of Crochet Easter Eggs! One of the most fun parts of Easter for all ages involves the classic Easter egg. Decorating eggs, hiding eggs, and collecting eggs on Easter bring back nostalgic memories for adults and create new ones for kids. The colors of Easter eggs also make them a great subject for crochet. In this roundup, you'll find the best Easter crochet patterns for amigurumi eggs as well as egg decor and accessories. These crocheted Easter eggs are great if you are vegan, want something non-perishable that your kids can enjoy all year long, or like to create pretty decor. This crochet pattern is basic and provides suggestions for adaptations to more complex designs. If you want to tackle something a little bit more difficult but well worth the effort, give these thread crochet Easter eggs a try. They are made with thread using basic crochet stitches. For shaping, they are worked around a party balloon, papier-mache style, and stiffened for a sturdy lace design. These thread crochet eggs make great ornaments, table decor, and Easter basket fillers, offering a vintage nod to the season. 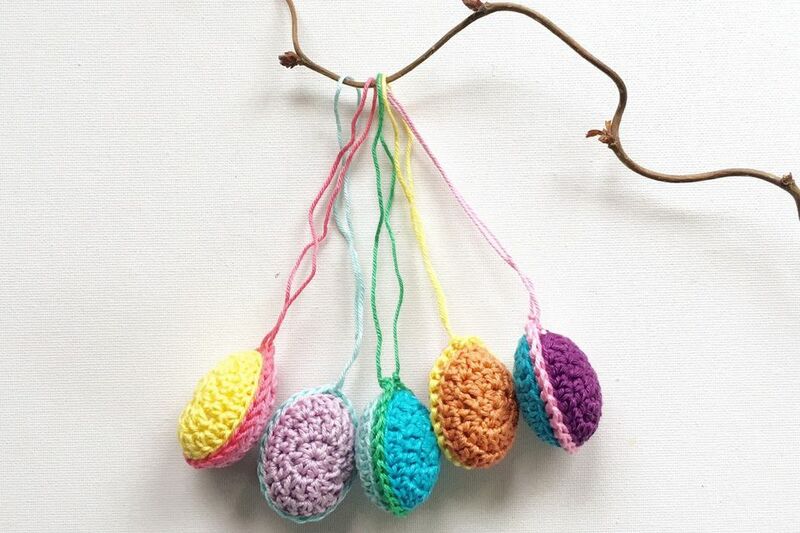 Instead of making full-sized amigurumi Easter eggs, you crochet tiny little ornament eggs instead. These are perfect for dressing up your DIY Easter tree with bright colors. Crochet this adorable and unique Easter egg creation. First, it is designed to wrap around a plastic egg; it also can hold and be opened to reveal Easter candies inside. Second, it has soft stuffed arms and legs, so it makes a neat little toy. And finally, it is inspired by a fun monster–cute but very unique among Easter toys! Make these large crochet appliqués to decorate Easter trees. These lovely examples have been strung onto a garland for easy wrapping around the tree. Embrace all of the colors of Easter eggs to create a beautiful crochet blanket. This blanket is terrific for babies and children, especially in pastel colors. Crochet the blanket with darker colors for use throughout the year by anyone in the home. Your baby's first Easter pictures will be super cute when he or she is wrapped up inside of this adorable Easter egg cocoon. This crochet design includes our crochet chick hat pattern. Your Easter dinner preparation will be so much more fun with a handy set of cute crochet potholders. This design features a precious chick inside of a colored Easter egg. These crochet potholders are made with the bright pastel colors of Easter along with terrific floral accents. You can also use the same pattern to create Easter cushions or a table runner. This crochet square pattern can be used on its own as a potholder or decor piece. Alternatively, mix and match it with other 6" crochet afghan squares to create crocheted garments, accessories, and blankets. Also, this pattern includes instructions for making it a spring flower basket instead of an Easter egg basket. This set of filet crochet Easter eggs can be used as placemats or hung up as Easter decor. They feature baby chicks, other Easter birds, and an Easter egg inside an egg. This is a free pattern, but you do have to know how to read filet crochet charts to complete them. Stitch lovely doilies to adorn your Easter table with this star-shaped Easter egg doily pattern. This crochet doily pattern does not incorporate eggs into the crochet design but instead stitches egg holders designed to hold real Easter eggs. The doily is fairly simple with elaborate egg cups emerging out of the doily-like 3D garden flowers. This easy set of repeating crochet stitches creates a design that looks like eggs. This pattern includes instructions for making a blanket in five different sizes. Crochet ​the eggs all in one color for a subtle effect or change colors after every set of eggs for a bolder design. Collect eggs in an Easter egg hunt or just-hatched eggs out on the farm with this handy apron. Play with different colors and have fun with this design's pocket-filled pattern!